View from City Creek south towards downtown. 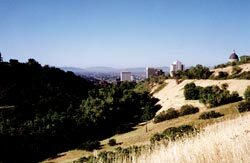 City Creek Canyon is the northernmost canyon in Salt Lake County and the closest to downtown Salt Lake City. Due to this proximity, City Creek heavily influenced the development of Utah’s capitol city. City Creek provided water for drinking, crop irrigation, and power to run grist, saw, turning, cording, and woolen mills. 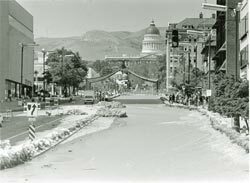 To this day, City Creek supplies water to Salt Lake City. However, with the water comes geologic hazards such as floods, debris flows, and landslides. In 1983 for example, the creek flooded its banks in Memory Grove Park and thousands of volunteers slung sandbags along State Street to channel the racing water. Three roads are located in City Creek Canyon. Bonneville Boulevard is a one-way road that wraps around the lower canyon from 11th Avenue on the east to 500 North on the west. Canyon Road parallels the lowermost reaches of City Creek and is closed to motor vehicles. City Creek Canyon Road follows the creek upstream of the intersection with Bonneville Boulevard. In the lower part of the canyon are three debris catchment basins designed to prevent debris flows from reaching downtown. Upstream at mile 3.0 on City Creek Canyon Road, a good example of a prehistoric debris-flow deposit can be seen. Along Bonneville Boulevard you can see at least two active landslides (miles 0.5 and 0.6), outcrops of both fine- and coarse-grained Lake Bonneville sediments (miles 0.4 and 1.0, respectively), and the remains of an ancient debris flow of volcanic (andesitic) rock and mud (mile 0.9). This volcanic rock came from a volcano that violently erupted some 35 to 39 million years ago, probably in the vicinity of either Little Cottonwood Canyon, Park City (about 25 miles southeast), or Bingham Canyon (about 25 miles southwest). Upstream of Bonneville Boulevard at mile 1.2 on City Creek Canyon Road, the canyon topography changes from relatively narrow and steep to broad and more rolling. This change reflects a transition of the bedrock from conglomerate that can stand as steep slopes, to weathered volcanic rock (similar to that seen at mile 0.9 on Bonneville Boulevard) that is unstable on steep slopes and has formed a large landslide. This prehistoric landslide appears to have crossed the creek and may have temporarily dammed it. Landslide dams are unstable and can fail catastrophically, releasing a flood of water. A second major change in the canyon is found at mile 4.5 where the road crosses the presumably inactive Rudy’s Flat fault, transitioning from the near-horizontally bedded, less than 40-million-year-old conglomerate to near-vertical, 300- to 400-million-year-old limestone beds that form large fins. This limestone was originally deposited in horizontal layers in an ancient ocean and later tilted to near vertical during the Sevier mountain-building event.